Almost five years after the (failed) comedy El crimen del Cácaro Gumaro, Mexican filmmaker Emilio Portes returns to the big screen with Belzebuth, a film that, unlike his previous work, soon reveals itself as something completely serious. Not for nothing the violently effective sequence that introduces the protagonist, a border police detective named Ritter (played by Joaquín Cosio) as he faces the "sweetest taboo" (a term that not long ago Fantastic Fest used for a compilation on the same subject ): child murder, showing without mercy a group of newborn babies -- Ritter and his wife's baby among them -- being victims of a nurse who ends up committing suicide. The killings of infants and other types of attacks will be repeated in different places -- a classroom, a swimming pool and a movie theater -- undoubtedly connecting the film with a reality more associated with the United States, even though Mexico can’t escape from it either. The bleak, violent tone of mex noir, with the detective working on crime scenes that certainly refer him to the worst day of his life, is interrupted so that Belzebuth, little by little, becomes a horror film of the supernatural subgenre, making use of such overexploited elements as demonic possessions and exorcisms. In this section, Belzebuth does’t contribute much and is a collection of clichés towards the classic exorcism that includes the archetypal characters of the "paranormal expert” -- Belzebuth is so conventional that in this role American actor Tate Ellington even physically resembles Leigh Whannell's “paranormal expert" from the Insidious franchise -- and the woman who knows how to communicate with the spirits (Giovanna Zacarías), who obviously contrast with detective Ritter's initial skeptical attitude. 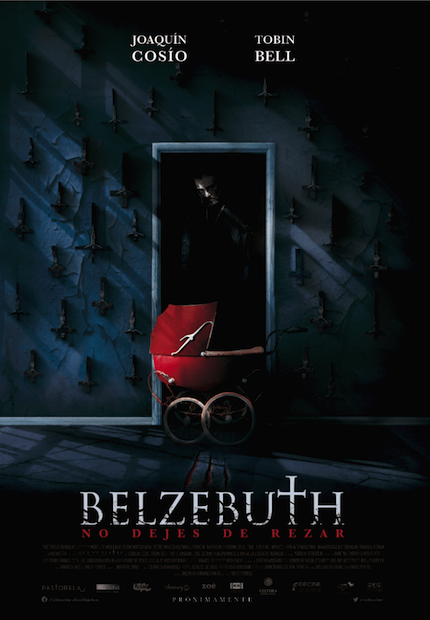 The script of Belzebuth, co-written by Portes himself, is a real disaster, beyond the commonplace things. It completely overshadows the striking initial sequences of violence, with its absurdly "complex" and consequently irrelevant explanations to link the main actions: the Mexico devastated by the narco war as the scenario of numerous miraculous resurrections that lead to a sort of cheap redo of Children of Men, with a priest (Tobin Bell, also an American actor given that much of the film is spoken in English) that maybe is the diabolical antagonist or the heroic main protector of the new messiah. In general, however, Belzebuth maintains relevant the point about Mexican genre cinema in which the curators/researchers Mauricio Matamoros, José Luis Ortega and Jorge Grajales agreed when I interviewed them in 2013, prior to the former horror exhibition in 35mm Masacre en Xoco: "We have good technicians. If only they could find good stories, not write them because they can't, we could have a better cinema." A version in Spanish of this review was previously published at Cinema Inferno.